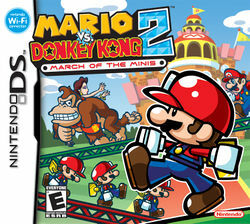 Mario vs. Donkey Kong 2: March of the Minis is a puzzle game and the sequel to Mario vs. Donkey Kong. This time, the focus is on the Mini toys created by the Mario Toy Company; along with the Mini Mario toys returning, more new toys were added for this game including the Mini Donkey Kong, Mini Toad, and Mini Peach toys. This game also marks the first appearance of Pauline in the Mario franchise since the Game Boy Donkey Kong game. Mario's Toy Company returns and is mentioned at the beginning of the game. It starts with a commercial promoting the new Super Mini Mario World, which is an outdoor amusement park centered around the Mini Marios, Mini Peachs, Mini Toads, and Mini Donkey Kongs. A crowd of Toads is shown watching Pauline and Mario about to cut the ribbon to open it. One of the Mario Toy Company's employees, Donkey Kong, is in the crowd. He immediately falls in love with Pauline and rushes to her with a Mini Donkey Kong to give to her, but Mario hands out a Mini Mario. She chooses the Mini Mario, so Donkey Kong is heartbroken and breaks down a sales post of Mini Marios, even crushing one with his feet. He then heads toward the elevator, grabbing Pauline on his way and knocking Mario to the floor. As Donkey Kong heads toward the elevator, Mario gets up and tries to get to the elevator, but he is too late to rescue her. Donkey Kong brings Pauline up to the roof of the building. Mario doesn't know what to do until two Mini Marios come to offer help. In the ending, Mario finds Pauline safe with tons of presents in a room on the roof. Donkey Kong looks sorry for what he's done, when a Mini Mario races across the floor to meet a Mini Donkey Kong. Pauline picks up the Mini Donkey Kong and kisses it, making DK happy. Toads appear and everyone waves, leading into the credits. Unlike the Game Boy Advance predecessor, Mario plays absolutely no role in this game; he is only seen in the beginning of each floor, and before each boss fight and in the final boss fight and following cut-scene. Instead, the task is to control the Mini Mario toys through eight diverse floors of nine levels each to reach Pauline. At the end of each floor is a boss battle with DK. There are 240 Minis in all - generally, there are more minis in a level as the difficulty increases (going as high as 8 in a level called 8-3). This change in game-play laid the foundation for the two Mario vs. Donkey Kong games that followed on the DS. In each level, the player attempts to move all of the Minis on the map to a portal-like doorway that has a red M on top - this is the goal. Moving the Minis around uses the stylus and touch screen entirely. Touching a Mini activates it. Swiping a Mini left or right moves it in that direction or switches directions. Swiping the same way across multiple Minis changes the direction of all the Minis. Swiping up makes a Mini jump. Swiping down on a Warp Pipe makes the Mini go down into it, and jumping and swiping up makes a Mini go up a pipe. Touching a Mini again stops it. Minis automatically change directions when hitting a wall or another Mini. Also, a Mini gives a warning "whoa!" noise when it is about to fall into spikes or another danger that will break it, including large heights. The two sets of colored blocks shown here protect the minis from Piranha Plants. Additionally, a Gold Mini Mario bonus is set up, and they are close enough for a perfect chain. What makes the game challenging is the requirement of having to move environmental pieces of the level around to reach the Goal. For example, colored blocks (most commonly pink) can be realized if the player has a certain number of blocks in the inventory - for example, players can take three blocks from one part of the level and use them somewhere else, perhaps where the Minis need to cross first. Other such examples are elevators with an up and down pad and conveyor belts with a left and right pad. The player has 300 seconds to move as many of the Minis as possible when the timer starts. The timer does not start until a Mini is activated or colored blocks are removed - the player can look around the level using the D-pad (or buttons for left-handers) and plan what to do before beginning. Each Mini coming in safely is 1000 points. If all Minis come in safely, the bonus is 5000 points. Mini Mario Cards, one per level, are worth 1000 points. Getting Minis into the Goal very close to each other is called a chain. Starting at 1000, that bonus is doubled for each additional Mini in the chain; for example, 2 Minis in a row is 1000 + 2000 = 3000 points, and 4 minis in a row is 1000 + 2000 + 4000 + 8000 = 15000 points. The bonus increases exponentially. A blue sparkle surrounds the Goal to signify the chain is still going, and it lasts for about three seconds after the last Mini in the chain. If all Minis come in safely in a perfect chain (all Minis coming in within seconds of each other), there is another bonus of 5000 points. Finally, there is the Non-Stop bonus. It is achieved by having a Mini "never stop" from when it is activated to the goal. Stopping at an elevator or on an enemy doesn't count against the player. It is 1000 points per Mini, but having all of the Minis non-stop provides a big extra boost. By filling in all of the criteria above, the player can earn a gold star for the level. Below it is the silver star and the bronze star. It is possible to get no star, especially if the player loses more than one Mini. Stars are used to unlock extras at the end of the game. Each floor of Super Mini Mario World besides the Basement is diverse and has its own unique elements that sets it apart. They each consist of nine levels, a minigame, and a DK boss battle. In the PAL version of the game, the floor count for all floors excluding the Basement and Roof starts from "Ground Floor" and ends at "Floor 7", whereas in all other versions, the floor count goes simply from "Floor 1" to "Floor 8". In each level of a floor, there is a Mini Mario Card - a card with a letter on one side and a Mini Mario's head on another. With nine levels, the cards spell MINIMARIO on each floor (i.e. 7-3 would have a N card). Finding all cards in a floor unlocks a single minigame: Shy Guy Smash! In it, the player uses the stylus to break (touch) 25 Shy Guys within 30 seconds, coming out of pipes. Unfortunately, not only do the pipes become more complicated as the floors increase, Bob-ombs are thrown into the mix - tapping them loses 5 points. The player is challenged to beat his or her high score after getting over 25, for replay value. Tropical Island, an even-numbered floor (2), forces the player to use falling coconuts from trees to hit DK instead of hitting him directly. Landing on a tree top makes the coconut fall. Each floor is concluded by a boss battle with Donkey Kong. Players must launch Mini Marios from a cannon up and hit Donkey Kong either directly or indirectly, depending on conditions. The number of Minis available depends on how many Minis the player got to the Goal in the nine levels. In odd-numbered floors, the cannon will shoot directly up, trying to hit DK from below. In even-numbered levels, DK is protected by a spiked platform from the bottom, and the cannon is adapted to hit off of walls to reach above him instead, as illustrated to the right. Minis are broken by sharp points, DK's projectiles such as bananas, barrels, weights, mines, even fireballs, or in the later battles, Swoops (Spooky Attic) and Snapjaws (Jungle Hijinks). DK has six hit points in all battles. Each of these boss battles is also capable of getting stars, but the score is calculated differently: The gold star minimum is the maximum number of Minis on the floor times 1,000 (25,000, 30,000, etc.). Each second left on the clock is ten points (each boss battle starts with 180), and each Mini still "alive" is still 1000 points. Getting a gold star thus should mean that no Minis can be destroyed and perfect play is required. However, in theory, it is possible to win with over 100 seconds of time remaining - which is 1,000 or more points left over - which means that a player can still miss one Mini and earn a gold star. Silver stars are generally 75% of the Minis surviving, and bronze stars 50%. Immediately after the Minis defeat Donkey Kong at Jungle Hijinks, the final boss battle begins. Here, the level 25m from the original Donkey Kong game is used. Mario waits at the top screen, while DK throws barrels down into the lower screen. Minis will actually come from the Goal, and it is the player's job to get six Minis into the upper screen for Mario to throw at DK before six Minis are destroyed by barrels or fires from the tar pit (also from Donkey Kong). Ladders accompany this section, as well as the Hammer power-up on two occasions. This battle is not ranked and the ending and credits follow success. Main Game - described above. There are three save files. Construction Zone - A Level Editor feature is also present in this game, where players can create their own levels. Friends can also utilize a Wi-Fi connection to share levels online. Play Level - Levels created by the player or received from others, that have passed a play test (all Minis can reach the goal), can be played here. Edit Level - Players can create or edit a preexisting level here, from one of eleven kits. See how kits are unlocked is described below. Erase Level - Players can delete levels at will. Nintendo WFC - These options allow interactions with other players. Synchronize - Players must connect to the WFC to get their own levels ready to send to others. Receive - As long as each player know each other's friend codes and have them installed under their friends list, levels can be received from either at will. Nintendo also has been publishing a level every so often. Nintendo WFC Config - Players can get WFC setting ready here, like in any Wi-Fi game. WFC Friends - Up to sixty friends can be stored here, registered with a friend code. The player's friend code is on the top screen. Multi-Card - Two friends, each with a copy of the game and close to each, can send and receive files locally. Broadcast - Same as sending. The other player must choose "Receive" for this to work. Receive - The other player must choose "Broadcast" and choose a level for this to work. Options - March of the Minis has some unique features and bonuses. Audio - adjusts settings from Stereo, Surround, or Headphones. The player can hear every sound effect and music track in the game when they beat the Main Game. There are one hundred forty four sound effects and seventy seven music tracks in all. Movies - Players can watch the four real-time movies again and again here. Only one - pre-title - is unlocked at the beginning, so again the Main Game must be played to find them all. The additional movies are Introduction, Ending, and Musical. Gallery - Players can look at eighteen pictures from the Main Game here. sixteen are two from each floor, before and after the boss battle. The next is before the final battle on the Roof, and the last is from beating the first level in the basement. Credits - Replays the credits. The player must finish the Main Game at least once to unlock it. Title - On the title screen, Mini Marios walk across the bottom of the top screen. This cosmetic feature can be changed, but it requires stars to do so. Register - Players can register their name as it appears in the Construction Zone and Wi-Fi Connection here. Single Card - A demo version of the game can be sent to another DS player without the game card. Erase All - Not only does this delete all Main Game data, but all Construction Zone levels, created or received, and it resets the player's friend code. NintendoWiFi.com - Players can choose to let their statistics be part of Nintendo's official Wi-Fi site. Mario and Donkey Kong watch their Minis acting in the pre-intro movie. Coin Coins are used to raise the score. 10 Gold Coin 10 Gold Coins are used to increase the score, but are worth 10 normal coins. Mini Mario Card Mini Mario Cards are collectible items with a picture of Mini Mario and a letter on the back of them. There are 9 cards per world. Door Doors are the goal of the levels. If all the Mini Marios make it to the door the level is won. Hammer Hammers are found floating in some levels. Hammers allow the Mini Marios to defeat enemies.
? Block ? Blocks contain Fire Flowers. Fire Flower An item that comes out of a ? Block, it turns Mini Mario into Fire Mini Mario, which allows him to hurl fireballs within a limited time to stun or defeat enemies. Pink Block Pink Blocks are objects that are used as bridges between the corresponding bracket. Pink Blocks can be collected and placed within a level. Yellow Spring Yellow Springs are used to fling Mini Marios to higher places. Blue Spring Blue Springs are used to fling Mini Marios to higher places, but also flings them forwards at the same time. Conveyor Conveyors are objects that move in one direction, but can be reversed using a button. Mini Marios can't go the opposite direction because the conveyor belt moves faster than the Mini. Elevator Elevators are platforms that move up and down. Once the direction of the elevator is selected it can't be changed until the elevator reaches a floor. An elevator can hold up to two Mini Marios. Color Switch Color Switches let the player open gates with the same color, while closing gates that have different colors. There are 3 colors of Color Switches. Warp Pipe Warp pipes send Mini Marios that enter it to a different part of the level. Rotate Pipe Rotate Pipes are warp pipe sections that rotate 90° when tapped to allow the player to reach different warp pipe exits in the level. Magnetic Block Magnetic Blocks allow Mini Marios to walk on any direction, even upside-down. They can be collected and placed within a level. Swing Bar Swing Bars are objects that can be used to cross gaps. They can also be used to launch Mini Marios upward. Donut Block A block that falls after being walked on by Mini Marios. Fire Block Fire Blocks are blocks that can burn wood. Bomb Block Bomb Blocks are blocks that can destroy breakable blocks. Construction Kits. In the Construction Zone, players choose a kit, one from each floor that incorporates the elements and enemies of that floor. Players unlock each kit as they beat the DK boss battle for each floor. Bonus Construction Kits. By completing the minigame in each floor (and ultimately collecting all of the Mini Mario Cards), special kits are unlocked (Kit 1 is Floors 1-3, Kit 2 is Floors 4-6, and Kit 3 is Floors 7-8). Not only are the elements combined from the floors (with some bonuses, with Special Kit 3 containing every element in the game - and more), but players no longer control Mini Marios. Mini Toads, Mini Peaches, and Mini Donkey Kongs now become playable, respectively. Title Screen Change. To change the Mini Marios on the title screen into Mini Toads, Peaches, or Donkey Kongs, the player needs to have eighty bronze, silver, or gold stars, respectively. Then he or she can change it in the Options → Showroom. They all must be a certain star to be unlocked - seventy nine gold and one bronze still only unlocks the Mini Toads. Basement. After defeating the main game, returning to the same save file directs the player to the basement of the theme park, sub-titled "DK's Hideout". Two bonus boss battles similar to the final battle await in Levels B1 and B2. To access them, though, the player needs forty silver and forty gold stars, respectively. B1 requires the player to run over twelve platforms that disappear on contact, six on the upper screen and six on the lower. B2 requires the player to get Minis to the upper screen so they can push a barrel onto Donkey Kong. B1 unlocks the final gallery image; B2 unlocks the final movie. These battles are also not ranked. Nintendo DS Carig Harris, IGN 7/10 "The original Mario vs. Donkey Kong is a far better puzzle game than March of the Minis is, but that doesn't make this game a bad one. It is a clever Lemmings-inspired, touch screen design with a great focus on user-submitted content to keep the game going on and on. Its similarities to the first game are only in looks; the concept goes in a refreshingly different -- but just not as successful, addictive or challenging -- direction for Nintendo DS gamers." Nintendo DS Jeff Gerstmann, Gamespy 3.5/5 "So, in a nutshell, Mario vs. Donkey Kong 2 is a mixed blessing. It's got some fun and elaborate puzzles, although some get a tad too elaborate to manage at once. Also, certain parts of the gameplay mechanic, such as the responsiveness of the touch screen while steering Mini-Marios around, don't function as well as we would have liked. Still, for those who find themselves drawn to the game, the title's stringent requirements for a gold star will generate lots of replay value, just as the excellent Wi-Fi setup will. Even if Mario vs. Donkey Kong 2 apes Lemmings on PSP (again, no pun intended), it emulates most of that game's best elements, although its flaws seem to be rooted in both the hardware and its inability to sustain the previous game's sense of joy." Nintendo DS Kristan Reed, Eurogamer 7/10 "So what's this pleasant puzzle diversion worth in the grand scheme of all things DS? On the plus side there's nothing quite like March of the Minis on the platform; it's yet another game oozing with intuitive Nintendo design genius that makes it an instantly pleasurable game to pick up and enjoy from the start. But although it's the sort of game that lends itself perfectly to short commutes and coffee breaks, its strengths are also its Achilles heel - many won't appreciate the simplicity, or the fact that there doesn't appear to be enough of a substantial challenge to grab your attention for very long. Not for everyone, then, but well worth further investigation if puzzling's your thing." For this subject's image gallery, see Gallery:Mario vs. Donkey Kong 2: March of the Minis. Most of the music are cover versions from other games. The only original compositions in the game are the Pipe Works theme and the main menu theme. Mushroom Mayhem: cover of #-MM levels from Mario vs. Donkey Kong. Tropical Island: cover of Donkey Kong Jungle theme in Mario vs. Donkey Kong. Magnet Mania: cover of underground Levels from most of the Mario games. Lava Dome: cover of Bowser's Castle in Super Mario Bros. Toadstool Castle: cover of Princess Peach's Castle in Super Mario 64. Spooky Attic: cover of Spooky House in Mario vs. Donkey Kong. Jungle Hijinks: cover of "Simian Segue (Jungle Theme)" from Donkey Kong Country. Boss Battles: cover of first boss theme from Mario vs. Donkey Kong. Final Boss: fusion between the 25m theme from the original Donkey Kong and "Simian Segue (Jungle Theme)" from Donkey Kong Country. Minigame: cover of the bonus game theme from Mario vs. Donkey Kong. If Mini Toads, Peaches, or DKs appear on the title screen, the title music from the original Mario vs. Donkey Kong plays. Donkey Kong: Pauline makes a return to the Mario series. Certain levels are based off of ones found in this game. Super Mario Bros.: World 5 uses the castle music from this game. Also the main theme is remixed several times. Donkey Kong Country: Music from this game is featured in the jungle levels. Mario & Wario: Very similar gameplay to this game. Super Mario 64: Music from this game is featured in the castle levels. Mario Power Tennis: Several of Donkey Kong's voice clips are recycled. Donkey Kong Jungle Beat: Several of Donkey Kong's voice clips are recycled. Mario buiesu Donkī Kongu Tsū Mini Mini Dai Kōshin! Mario vs. Donkey Kong 2: Mini Mini Big March! The game's title name is an allusion to the Beatles song "March of the Meanies". In the Level Editor, it is possible to have only one Mini - it's an all or nothing deal (Mini in = 1000 + all in + perfect chain + all non-stop (6000) = 17000 points OR Mini out = failed level, 0 points). The G/S/B is 18200/13200/7200, but unless the player has under 120 seconds left and there are few coins, they are almost forced to get a gold or no star. 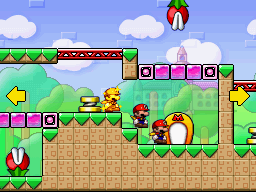 Players can create only eight levels in the Construction Zone, yet receive up to twenty-four levels. The credits show 3D pictures of some of the Mini poses and enemies, likely as a throwback to the similar credits pictures in the first Mario vs. Donkey Kong. When players close and open their DS (putting it in and out of sleep mode), Mario has some things to say, such as "Hey, come back here, you big-a monkey! ", "Let's play again! ", and "I love this game!" This feature was also used for the sequels, Mario vs. Donkey Kong: Minis March Again! and Mario vs. Donkey Kong: Mini-Land Mayhem! The gameplay of this game is similar to that of Mario & Wario. ↑ 1.0 1.1 Zephiel810. (February 21, 2017). Mario vs. Donkey Kong 2: March of the Minis - 100% Walkthrough - World 2: Tropical Turmoil. YouTube. Retrieved February 21, 2018. This page was last edited on April 7, 2019, at 02:05.